This progressive and sophisticated solna type four colour sheet offset printing machines fulfills even the most demanding requirements to printing quality, reliability, and service life of the machine. Perfect covering of the screen dot and precise register guarantee high precision quality printing of various multicolor printed materials on any suitable paper. A well designed inking system with 20-Roller arrangement ensures smooth, even ink flow to the form rollers for extraordinarily high quality reproduction. Sturdy construction, bearer contact, improved pull side lay & three large form rollers of varying diameters for superior ink distribution ensure high quality dot sharpness & top printing quality. All cylinders are cast in one piece and are of treated alloy cast iron and hard chrome plated. The Fantastically Accurate SAHIL Four Colour offset helps printers to achieve greater flexibility. When the printer got the opportunities of four-colour printing job, they rely on SAHIL 425 / 428 Press. It has a fast make-ready as well as an incredible dot-for-dot fidelity. It is also a truly economical press, allowing four colour printing in one easy-to-set-up pass. With the SAHIL 425 / 428 Four Colour Offset you discover quality and performance normally found only in larger, more expensive imported, Rebuilt or used press machinery/equipments. Low Investment - The SAHIL multicolor offset gives you good value at a very attractive investment cost. Easy servicing, reliability and long service life all contribute to optimal pay-off. 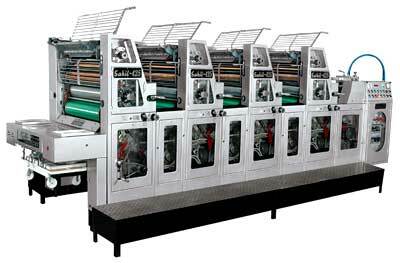 Ease of Operation - The SAHIL four colour offset is a user-friendly Reliable press, sturdy and easy to operate. it offers uncomplicated and fast plate changing with ergonomic & well tested design. Top Printing Quality - Sturdy construction, small cylinders, bearer contact and large form rollers ensure perfect dot sharpness. High Productivity - The SAHIL four color offset offer short make-ready times with a quick change of plates and possibilities of handling a great number of small and medium runs in minimum time.